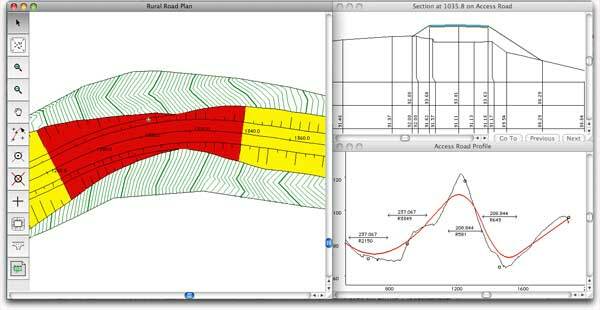 HighRoad is a software package that lets you design roads as you always have - graphically. It makes use of the proven graphical interface of modern operating systems so you can use the program immediately without learning complicated commands or special formulae. You don't need to be a computer expert to use HighRoad - its icons and graphics make it intuitive and quick to use. ...... HighRoad's proven "embedded intelligence" ensures that these elements remain synchronised as you make adjustments to your design. While it has a great amount of intelligence built in, HighRoad also provides you with the flexibility to override its decisions when necessary. The elegant interface of HighRoad means that it can be used for a variety of civil engineering tasks. As well as road design for subdivisions, highway planning, highway relocation, haul roads, and widenings, it has also been used for drainage channels, pipelines, retention basins, conveyor routes, open cut mines, race courses, airport runways, and so on. Drawing layout and production is simplified by the drawing manager and tracking of construction projects streamlined by the ability to calculate earthworks for progress claims. Building pad design broadens the capability of HighRoad without compromising its ease of use. Qweas is providing links to HighRoad for Mac 6.3.5 as a courtesy, and makes no representations regarding HighRoad for Mac or any other applications or any information related thereto. Any questions, complaints or claims regarding this application HighRoad for Mac 6.3.5 must be directed to the appropriate software vendor. You may click the publisher link of HighRoad for Mac on the top of this page to get more details about the vendor.